I received an email a few days ago, which I tweeted about and talked about on Facebook. I hadn't intended to reply to it, but today, I reconsidered. The email came from someone using the name of a character in a very old movie and a statue of Jesus as an avatar. There are no friends (other than Tom, of course), and the address is something like "tryingtofindproofofalie" or something along that line. WARNING: I have not clicked on any of the links, including the YouTube ones, and don't reccomend anyone else do so, either. "You are of [your] father the devil, and you want to do the desires of your father. He was a murderer from the beginning, and does not stand in the truth, because there is no truth in him. Whenever he speaks a lie, he speaks from his own [nature]; for he is a liar, and the father of lies. and you have not come to know Him, but I know Him; and if I say that I do not know Him, I shall be a liar like you, but I do know Him, and keep His word. "But for the cowardly and unbelieving and abominable and murderers and immoral persons and sorcerers and idolaters and all liars, their part [will be] in the lake that burns with fire and brimstone, which is the second death." And Peter [said] to them, "Repent, and let each of you be baptized in the name of Jesus Christ for the forgiveness of your sins; and you shall receive the gift of the Holy Spirit. I am sorry for any hurt that has come to your life as a result of my father. But taking it out on me isn't going to make you feel any better. I know he hurt a lot of people, but he was still my dad and I loved him. If you open your heart and mind a little past your own hurt, you would surely realize that my childhood could not have been an easy one, and there are people out there who he has hurt perhaps far more than he hurt you. My father is gone now. Now is the time to remember not the Bible verses about evil, but the ones about forgiveness. Trust me on this, you won't be able to move on until you first forgive. And if you don't forgive, all the Bible verses in the world are meaningless for you. Your heart will still be clouded with hurt and hate...the kind of hurt and hate that leads a person to write unkind emails to the disabled daughter of a recently-dead man. I hope you get the help you need, and that someday, you can write to me with your real name and not a profile you created to lash out from a deep pain. You might be surprised. But even if I never hear from you again, I hope you someday find peace. I meant every word of it. I hope whoever this was really does find some peace, and gets some help. Am I angry? I was, at first. No need to lie. But honestly? I expected comments, I expected backlash, from the moment I knew my father was gone. My whole life, I've had to hear nasty things about my dad, and people telling me (often in great detail), how much they hated him and wished him ill. I'd have to be a blind fool not to realize that he had his enemies and he'd done people wrong. I only had to look at my own mother to know that. But none of that really matters anymore. He's gone. He was my dad, and I loved him very much. My kids loved him. I have siblings and their kids, who are in pain and in mourning, too. I understand the anger and hurt that could lead someone to send me such an email. What I hope from them, and from anyone else considering it, is for them to try to understand the hurt I am feeling, too. No one deserved to be hurt by him, or anyone. But by taking it out on me...are you really any better? I wasn't going to blog about this right now, but after my last post, I received a lot of textx and emails with one simple question, requesting one rather important detail I left out...which sister? On April 17th, my sister Lisa passed away. 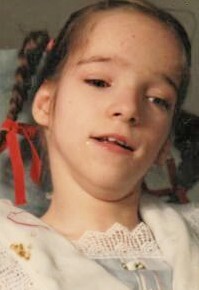 She had severe cerebral palsy. She never walked, never talked, and was blind from birth. Doctors said she'd die before the age of six. She was 33. Lisa was a bright and shining star in what was otherwise a cruel and unfair universe. I don't think any of my siblings--and this includes the myriad of half and stepsiblings--would call our childhoods anything other than a nightmare. It's something that never really leaves you, and while you're living it, it taints and stains everything and everyone you're associated with. Lisa was beautiful and sweet. She loved my father and her mother deeply, as well as her twin brother. Our family dog, Bear, appointed himself her protector and especially in his last years, rarely left her side. She couldn't speak, but had her own way of communicating that those of us close to her understood. She was, in many ways, like a baby: she had a cry for hungry, a smile and a laugh for happy, and so on. As a teenager, she attended the special ed classes at Centerville High School and an after-school program through United Cerebral Palsy. She loved school, and would get so excited while waiting for the bus to come. As she got older, her health deteriorated. She began having seizures. My father and stepmother eventually had to hire home healthcare workers to help. I have nothing but gratitude for Martha and Shiva, who cared for Lisa so long and so well. After the death of my stepmother, she was placed into a nursing home. It is where she lived, these last few years. She needed 24-hour care. It was beyond the capabilities of my stepbrothers. I have been estranged from them for years, but I know they must have agonized over the decision. In the end, love of Lisa was the only thing we all had in common. I will miss her laugh. I will miss how much she loved strawberry sundaes, never guessing we often hid her much-loathed medication inside. I will miss her. I take great comfort in the knowledge that she is back with her mother and my father, and now, she can run and dance and tell them all the things she never could before. She is now an angel. But then again, she always was. My dad died March 26th. My sister died April 17th. I'll write about both...when I can. I haven't lived in Ohio in nearly 14 years...but there are still rumors flying around about me. I know there isn't much to do in Dayton, but honestly, people. Get a hobby. Having to go back for my father's funeral, I heard a whole lot of them. Some of them seem to be quite persistant. So, I'm putting the matter to rest. I never dated him. We were just friends. I have not laid eyes on him since I was pregnant with my 13-year-old. If he was in Portland a few years ago, I was not aware of it and I did not speak with him or see him. Contrary to a rather popular rumor, my marriage is very much intact. We have never been separated, nor have we ever sought a divorce. We've been married for almost 13 years, and we lived together for years before that. My husband has never moved out, and we never had a "break" during which I dated someone else. I know the stories going around are far more steamy and interesting than the truth, but what can I say? I'm a married mom of three. And quite happy to be so, thank you very much. I have secondary-progressive multiple sclerosis and MS-related trigemial neuralgia. It's not a walk in the park by any means, but depsite what you may have heard, I am most certainly not on my deathbed. Most days I can walk with a cane, others I use my scooter. For anyone who is actually interested in my fight against MS and what my life with it is like, I invite them to read my blog, The Zen Pretzel Trick, at zenpretzeltrick.blogspot.com. I also routinely give "MS Updates" on my Twitter account @ZenAngelSinger. You can also learn about MS in general by looking up the local National MS Society chapter in your area. I am very open about my fight with MS, and I am happy to answer questions. My father passed away last month. I have heard of a rumor that he was shot or that foul play was involved. Again, the rumors are far more interesting than the truth. The truth is, my father was an alcoholic and a diabetic, and those two don't go very well together. I am not saying my father was never shot; those who know our family well are quite aware that my father had been shot at least 3 times over the years. Which leads me to the next rumor: that my father had bullet fragments that "exploded" while he was being cremated, or that he couldn't be cremated because he had said bullet fragments. Yes, my father had bullet fragments in his body. The funeral home and crematorium were very much aware of this and we were assured that there would be no problem, and there wasn't. He was cremated, and nothing exploded or had to be removed from his body in order to accomplish that. This is a particularly difficult time for me and my family, and these ridiculous rumors only add to the pain and loss we are all experiencing. I know damn near everyone likes to gossip every now and again, but please, let this one be. I have kids, as do my siblings, who are trying to come to terms with the sudden and unexpected death of their grandfather and they do not deserve to hear this garbage. Let my father rest in peace, and let his family mourn him without having to answer such odious and inappropriate rumors.